It’s election season! That means you’re already inundated with all-too-clever political communications – pesky political bloggers, perfectly impartial public service announcements, front-yard branding, townhall meetings (seriously? ), and, of course, the bumper sticker. To celebrate our great American loves for oil and partisan politics, the American Scene would like to invite you to participate in the 2010 Stick with the Scene competition. 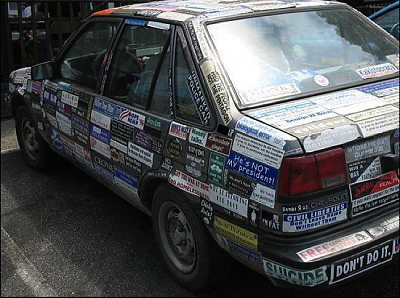 Here’s how it works: submit you favorite political bumper sticker or campaign slogan in the comments thread below, or e-mail submissions to stickwiththescene@gmail.com. Extra points will be awarded for visual creativity and relevance. Appropriate image files and e-mail submissions will be posted here throughout the competition (so please include your name and website!) for the entire family to comment and critique. All entries must be received by 11:59pm ET on November 1st, limit three entries per e-mail address. Five of the most popular and awesome submissions will be selected as finalists, and re-posted on November 2nd. This will be your last opportunity to vote for a winner, which will be announced with the national election results on November 3rd. The author of the winning submission will receive a $150 coupon and four finalists will receive $50 coupons for custom stickers, courtesy of our friends at Sticker Mule. The coupon can be redeemed online for a number of different custom sticker products – from iPod skins to classic bumper riders. Let’s stick what you’ve got! that’s was not a car! it should go on TV for promotion! And that’s why you spam. Replica Swiss Watch is currently in contention for the $50 silver!